If you’re on a diet program or healthy living patterns, you guys must be very selective in the choice of food for daily intake. As well as topping or sauce that used to eat bread or salad. Do you like mayonnaise or butter? Each of them has advantages both in terms of taste as well as the content of the substance in it. We are here to help you to be more sure of topping or sauce where gonna be your choice dining. Before determining the selection, we have determined the materials and function, as well as differences are also inside. So, check this out! Mayonais or mayonnaise (mayonnaise) is one type of sauce made from vegetable oil, the main ingredient in chicken eggs and vinegar. Mayonnaise is commonly used as a flavoring in foods such as salads or sandwiches. There was mayonnaise that use only egg yolks alone or use the juice of lemon or mustard as flavorings. There are a variety of ways of making mayonnaise. Mayonnaise is typically made from a mixture of oil, egg yolk, vinegar, salt and mustard. The tool can either be handmixer mayonnaise beaters, food processor, blender, or shuffled manually using egg beaters or fork. Mayonnaise can also be made from egg whites beaten with the original course at high speed using a food processor. Texture and flavor the mayonnaise that is produced is also similar to mayonnaise from the egg yolks. Homemade mayonnaise contains fat levels up to 85%, while factory production of mayonnaise contains approximately 70-80% fat content. 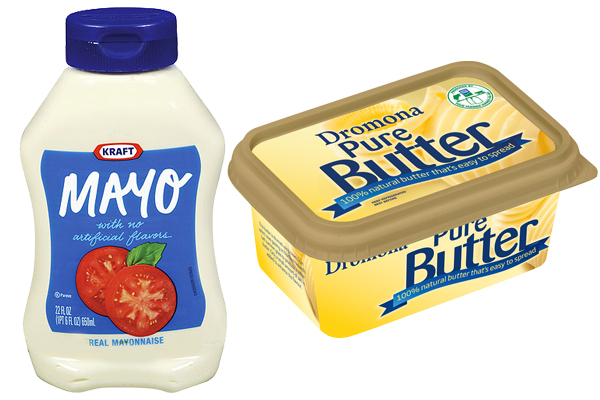 Low fat mayonnaise contains flour and other filler material to mimic the original mayonnaise. Butter has a pale yellow color, and a softer texture than margarine. Butter made from cow’s milk is also easier to melt than margarine. Therefore, the butter is not good for too long kept in room temperature. The aroma of butter is much more powerful and tasty than margarine made from vegetable oil. And because it is made from animal ingredients, butter on the market, has relatively more expensive prices than margarine. Butter is useful for cooking, such as frying and grilling. Butter can also be used for greasing foods such as bread and cake. In terms of its usefulness, butter is better suited in making pastries. Butter contains carbohydrates, fat, vitamin A, and d. Fat in butter is indeed quite a lot. And it is a saturated fat. The consumption of saturated fats and often too much is not good for health, particularly for problems with cholesterol. If you for the healthier, of course the answer will be on butter. This comes with a reason that butter contain higher vitamin, but you have the other option if you would prefer to eat mayonnaise instead of butter, there are other equally healthy ways out there to get those vitamins. But, both of butter and mayonnaise are actually can be part of a healthy diet, if you eat both mayonnaise and butter in moderation.